1. Take a large number of individual tracks. 2. Put the first 64 into a playlist. 4. Play (no skipping allowed). 5. After two tracks, decide – as quickly as you can – which of the two you want to hear again. 7. Repeat until playlist is over. You will have 32 tracks left. 9. Play (no skipping allowed). 10. Using the process outlined in 5-7, go through the playlist until you have 16 tracks. 11. Add another 48 tracks to the playlist. 12. Repeat steps from 3. This is – mostly – how I’ve been listening to music for the last month or so. It started with the realisation that I had close to 50,000 MP3s on my hard drive and – even accounting for duplicates – the majority of them were rarely, if ever, listened to. So I wanted a method of listening to them. I could of course have come up with a simpler method – i.e. put a bunch on a playlist, play them, keep the ones I liked – but I wondered if formalising that would be more fun for me. And it is. At least, it’s more fun than it looks. The Mincer has several advantages. On average songs get two listens, in practice there’s a long tail distribution where most get one but ‘winners’ get a lot. If you discover an amazing song you hear it often enough that you keep enjoying it, not so often that you wear it out. You become terribly fond of long-stayers. You are often forced to give OK or mediocre records a second chance, by the luck of the draw, and these might grow on you. You learn about your tastes, prejudices and moods by having to choose between utterly different records. And you can keep topping up your playlist with new tracks, so it works as a way of staying current too. (I suspect, given enough lead time, it would be a good method for getting through something like the massive torrents of new music you get prior to SXSW). And, like most gamification, it is basely engaging in a slightly gross, what-does-this-say-about-me way. However clinical this approach sounds, it’s having the desired effect – I’m actually listening to (and frequently loving) the swathes of music I’ve so gluttonously acquired. It’s not without its problems. Occasionally you get two songs you’d like to keep. You can always cheat, though. I don’t, but then I enjoy the straitjacket. You have to interrupt your listening occasionally to delete tracks, which can be a hassle. 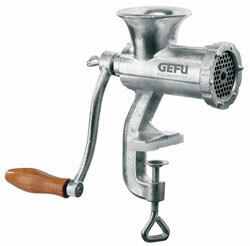 And on some level you’re treating songs as cannon fodder, not as works of art, which is why I called it the Mincer. But art and beauty are hardy creatures and in my experience adapt to this better than they adapt to being locked on a hard drive somewhere and ignored. Oh, and it probably doesn’t work for albums. I’ve not tried. I’ve also got lots of music I’ve been listening to more ‘normally’ – albums included – but there’s something addictive about the mix of discovery, rediscovery, and gladiatorial brutality which makes me keep returning to the Mincer. Give it a try! Or don’t. Run screaming.